Last night, I finally had removed my cherry blossom nail art, but wasn't able to do another design on my nails until a while ago, because I have to play my priority role first, i.e. "a mother" to my 18 month old son, who had slept very late last night (his unusual sleeping time). 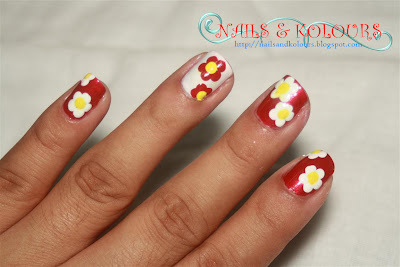 But anyway, now that I have time to do something on my nails, I made another set of flowers on it. I think I have to master flower designs first before going into another. yikes! 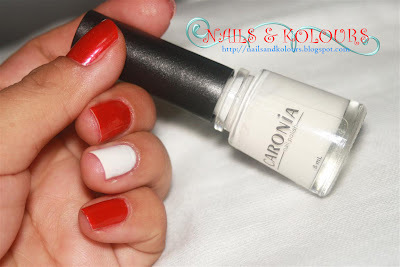 For the base nail color, I chose lacquers this time from Caronia. I used White Satin for the ring finger and Desire for the rest of the fingernails. 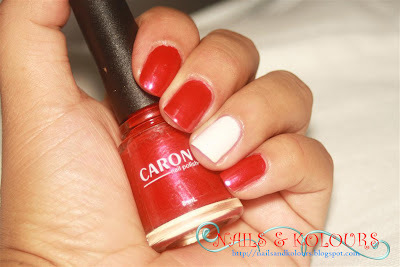 Desire is one of the colors of Caronia that I got last Saturday at SM City, CDO. Actually I was looking for the their "Tropical Doll Collection" but sad to say I wasn't able to find it. I'll have to check out other stores for the collection, and I hope to get it soon. And now for the design, these flowers that I sometime look at it like "sunny side up fried eggs", I should have used red on the flower center, lol were drawn using acrylic paint and a dotting tool. This time, I already know how to adjust the consistency of the acrylic paint just by adding a drop of water. The petals are not that perfect yet (need more practice). But still the red/yellow flowers on the white satin base look really great for me, so I think I'll settle on this design for now until I find time to redo it. Its nice, if only i can do it myself i will try it, cool! Wow! It's been a while since I've seen Caronia brand of nail polish. Paguwi ko ng Pinas, mag hoard ako ng nail polish promise hehehe! 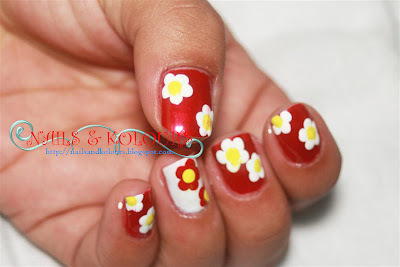 I love nail art, they look so cute and whimsical. Unfortunately I am too old to have my nails done with art, but that does not stop me from appreciating them. You have a great pulse for nail art! Love it.